Some Q is not P is a possibility. All Q is P is a possibility. Some P is not Q is a possibility. There is no possibility in No statement. If the conclusion comes with NO, then there is no possibility occur. Some Q is p is a possibility. No Q is P is a possibility. 1) When there is no relation found between the statements, there is always a possibility true. Some P being R is a possibility. The First conclusion is right because in it there is a word written possibility, while the second Conclusion is wrong because it is the absolute conclusion. What is a Complimentary pair? A complimentary pair is a type in which both conclusions are not true at a time and are not false at the same time. So, from the both conclusions one have to be true while the other has to be wrong. 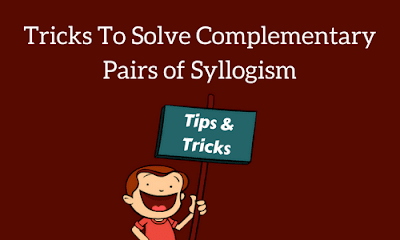 When the answer given like either 1 follows or 2 follows, it is a case of complimentary syllogism. There are three different types of complementary pairs. Let’s look at complementary conclusions.